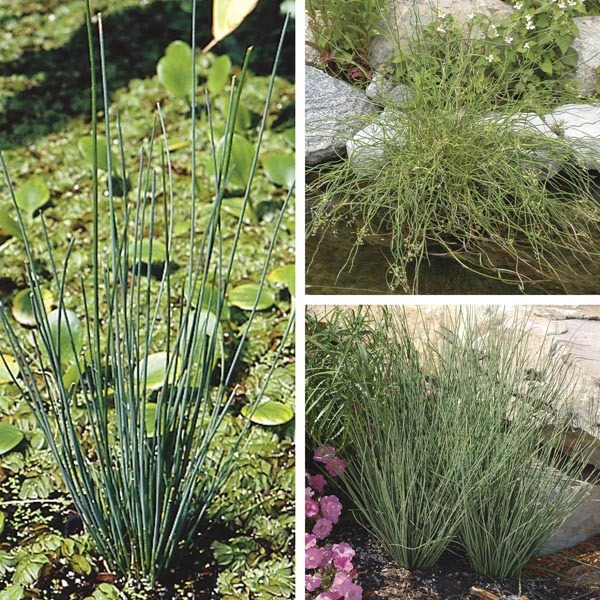 Juncus provides the same design effect as other ornamental grasses, but with a lot more substance and definition because the blades are tubular rather than flat. Varieties are also available with very decorative, curling "corkscrew" foliage. These are particularly fun used as the centerpiece of a mixed container planting. The blue-green foliage of Juncus adds a cool hue to the garden or makes a striking contrast when combined with bright flowering plants. Thrives in constantly wet areas where most plants would fail. Perfect for all kinds of containers, damp garden areas, or waterside plantings. Performs best in slightly alkaline, organic-rich soil. Place in areas that stay wet all year, or in water 1-3" (3-8cm) over soil. Divide plants every three years for best performance.